The picture on the left was taken on the day Dominick and his siblings moved in. The one on the right is from the day he left. He transformed from a baby-faced boy, into a sleek, handsome young man. But still such beautiful blue eyes. Such a handsome boy. You be good now for your ForeverMom, and be nice to your sibs!! Snorgles! Aww... he lost his baby fat. I say it every itty bitty time, but it's so true:Each kitty in the universe and each litter is so unique. No matter how often we meet an ibk and are reminded of one of our own or of one from a previous family, the truth is that each of them, like each of us, is unique and beautiful. I could stare into those baby blues all day. 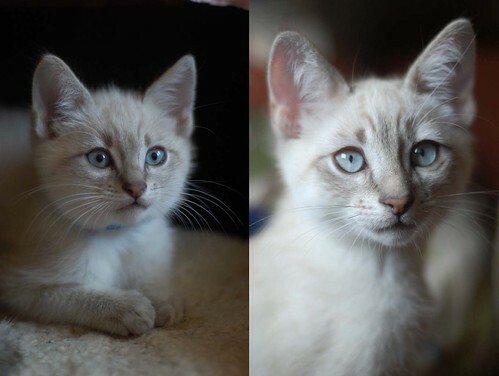 I'm going to meet two kittens tonight at a shelter near my home, and I know they'll both steal my heart. And since I can't bear to separate two siblings, I know I'll probably end up with both, in addition to my two year old kitty. Isn't it funny how such a small kitty (or kitties) can have such an impact? Andrea, congratulations! Comment and let us know how it goes, who you meet and how in love you are. What a handsome Lad ! i love elongated boy cat faces. Looking forward to future photos of Dominick (and all the Fortunatos). Wow, he totally looks like a man cat now - they change so quickly! Awww... what a handsome boy! I agree with Amy - they change so very quickly, yet remain so much themselves. It doesn't seem like he was here long enough to change that much! What a handsome young boy-kitty. Such a handsome boy. Those baby blues just get me every time. Andrea, thinking about your new ones got me thinking about my cat crew. I haven't had a kitten in 10+yrs. My last few all came to me as adults. That's what is so great about this site! I get my Kitten fix! Oh, Dom! You take good care of Miss Andrea now, you hear? And remind her to send pics so we can see you when you're a bruising mancat!